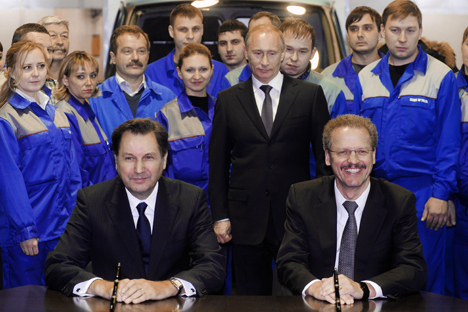 In the second half of 2013, mass production of the Mercedes-Benz Sprinter van will begin in Russia. The agreement to undertake this project was reached last summer at the St. Petersburg International Economic Forum. The Russian vehicle market is not going through the best of times. The two-figure growth in sales of new cars and vans that was maintained in 2011–2012 has given way to stagnation. In March 2013, sales of new cars in Russia were down 4 percent from the same month a year earlier. This completely canceled out the hesitant growth in sales in January and February. According to AEB data, in the first quarter of 2013, GAZ Group succeeded in selling almost 17,000 new vehicles in this segment, or 2 percent more than in the same period last year; meanwhile, the German vehicle company increased its sales in Russia by 24 percent. However, in absolute terms, the company’s result is much more modest – just 835 new vehicles in the first three months of the year. By comparison, its German compatriots at Volkswagen AG had a 4 percent drop in sales in the first three months of the year, but sold 3,466 vehicles in the LCV category. Daimler will soon be able to substantially expand its market share, though. Last summer, during the St. Petersburg International Economic Forum (of which Mercedes-Benz is a partner), the German company and GAZ Group signed an agreement to produce Mercedes-Benz Sprinter vehicles at the GAZ plant in Nizhny Novgorod. Daimler’s investment in adapting the product, production processes and the sales network will be more than €100 million (about $130 million), and GAZ is investing more than €90 million ($116.9 million). The production capacity is rated at 30,000 vehicles per year. Daimler is not the only foreign partner working with the biggest Russian manufacturer of vans and (in the Soviet past) Volga cars for heads of industrial enterprises and officials. The company now cooperates with Volkswagen (production of the Skoda Yeti began in Russia recently) and General Motors. “GAZ Group’s industrial partnerships are enabling it to modernize 200,000 square meters [2.1 million square feet] of production space. Total joint investment with its partners in the company’s international projects is about €500 million [nearly $650 million],” the company stated. The two companies’ plans also include localizing production of the engines and other components for the Mercedes-Benz Sprinter in Russia. The arrangements for producing this vehicle at the GAZ plant include construction of new assembly and welding lines, as well as a new paint shop. Mass production of the vehicles will start in the second half of 2013, RBTH was told by Andrei Rodionov, Daimler’s representative in Russia. The new facilities will assemble the previous generation of Sprinter van, which is aimed at the mid-priced segment of the market. The most recent generation of Sprinter, which is manufactured in Düsseldorf, will continue to be imported into Russia by Daimler. The GAZelle vehicle, which is a GAZ product, is absolutely dominant in the budget segment of the van market in Russia. “We’re expecting big orders, because the vehicle that we’ll be producing in Nizhny Novgorod is designed for carrying both passengers and goods,” said Rodionov. Thanks to cooperation with GAZ, the Sprinter will have no problems getting into the market, estimates Investcafe analyst Andrei Shenk. “Bearing in mind that the plant’s capacity will be about 25,000 vehicles per year, this model will be able to take about 12–13 percent of the market within three years, if the growth in the market remains at 3–4 percent,” said the expert. This year, Daimler is planning to continue supporting the St. Petersburg International Economic Forum, which will take place on June 20–22. The company did not confirm whether there were plans to sign new contracts, but it said it sees the forum as more than just a place for talks. “We have long provided a full range of transport services. We provide more than 200 vehicles – mainly S-class, but also E-class and minibuses,” said Rodionov. In addition, once the forum is over, it will be possible to sell a significant number of the vehicles as used. “Most the vehicles that go to the forum are sold before the forum,” said the Daimler representative.